People create Legacy Gifts for different reasons. For some, it is a way to ensure their memory lives on. For others, it is a way to ensure that organizations like ours continue to have an impact on the communities around us. We invite you to join the people advancing our mission through a Legacy Gift. 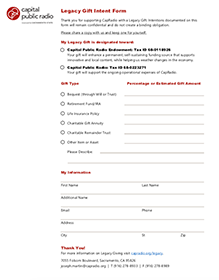 If you have already included CapRadio or the CapRadio Endowment in your estate plans, but haven’t previously notified us, complete the Legacy Gift Intent Form (either hard copy or digital) and share it with us. For more information on joining our Legacy Circle, please contact Joseph Martin at (916) 278-8933 or joseph.martin@capradio.org. Thank you! Please fill out our Legacy Gift Intent Form to share information about your gift.